Donald S. Lopez, 84, deputy director of the Smithsonian's National Air and Space Museum, died of a heart attack on March 3. Mr. Lopez had been with the Smithsonian Institution since 1972, when he became part of the team led by Apollo 11 astronaut Michael Collins responsible for planning the construction and opening of the National Air and Space Museum. As assistant director for Aeronautics, Lopez was instrumental in developing the exhibits that welcomed visitors at the museum’s opening on July 1, 1976 and have made it the most visited museum in the world. Lopez became deputy director in 1983, a position he held until 1990. He served as senior advisor to the director before retiring in 1993. From 1993 to 1996 Lopez served as senior advisor emeritus. He was again appointed deputy director in 1996. It was his exceptional skills as a pilot that qualified Lopez to become an Air Force test pilot, which he did after serving in combat. He completed a short combat tour flying North American F-86s in Korea. Following an assignment to the Pentagon, he earned a bachelor’s degree in aeronautical engineering at the Air Force Institute of Technology and a master’s degree in aeronautics from the California Institute of Technology. He spent the next five years at the U.S. Air Force Academy as an associate professor of aeronautics and chief of academic counseling. After his retirement from the U.S. Air Force in 1964, Lopez worked as a Systems Engineer on the Apollo-Saturn Launch Vehicle and the Skylab Orbital Workshop for Bellcomm, Inc.
Lopez was a member of the American Fighter Aces Association, the Experimental Aircraft Association and is a Fellow of the Royal Aeronautical Society. In 1995, the National Aeronautic Association named him an Elder Statesman of Aviation; and in 1999, he was presented the Federal Hispanic Heritage Month Excellence in Leadership Award. He was also a recipient of the Frank G. Brewer Trophy in Museum Education. In 2006, he was inducted as a fellow by the Society of Experimental Test Pilots; and in 2007, he was honored as one of the living legends at the Gathering of Mustangs and Legends at Rickenbacker Field in Columbus, Ohio. 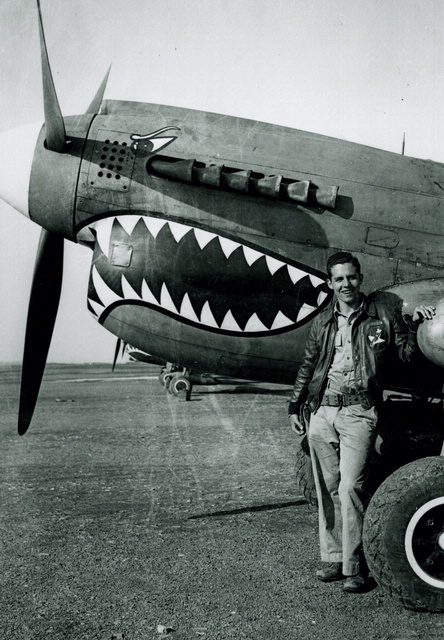 Lopez’s publications include “Into the Teeth of the Tiger” (Bantam, 1986), “The National Air and Space Museum: A Visit in Pictures” (Smithsonian Institution Press, 1989) and “Fighter Pilot’s Heaven: Flight Testing the Early Jets” (Smithsonian Institution Press, 1995). Lopez is survived by his wife Glindel, his son Donald Lopez Jr., daughter Joy Lopez and granddaughter, Laura Lopez. The family has asked that anyone who would like to honor his memory make donations to the National Air and Space Museum Donald S. Lopez Memorial Fund. Don Lopez, Deputy Director of the National Air and Space Museum, poses with a Curtiss P-40 while on a tour of duty in China. Deputy Director of the National Air and Space Museum Donald Lopez, circa 2005.